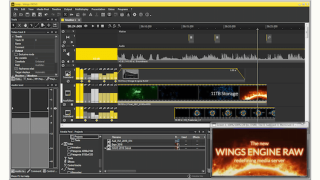 AV Stumpfl has enhanced the software of its upcoming Wings Vioso RX software, adding a video decoding algorithm that uses specialized GPU instructions instead of regular CPU processes. AV Stumpfl has been developing a new solution for video playback in the entire lineup of video servers and players. In the past, decoding of compressed video contents has been done in the CPU of a media server and the decoded data was transferred via the PCI bus to the GPU for playout. Using the newly implemented technology, the data is transferred still compressed over the PCI bus and unpacked and decoded in the GPU. This way, a way higher bandwidth and more decoding power is made available, resulting in higher image quality, more concurrent video layers, and higher resolutions on the same physical hardware platform. The current Wings Vioso platform has no content limitations, even if they exceed the maximum texture dimensions of the GPU; nevertheless, the new compression technology helps to fill the gap between uncompressed and regular video compression algorithms.